Quincy R. Lehr was born in Oklahoma City, and he lives in Brooklyn, where he teaches history. His poems, criticism, and essays have appeared in numerous journals in North America, Europe, and Australia. He is the associate editor of The Raintown Review, and his most recent book, Obscure Classics of English Progressive Rock, appeared in 2012. 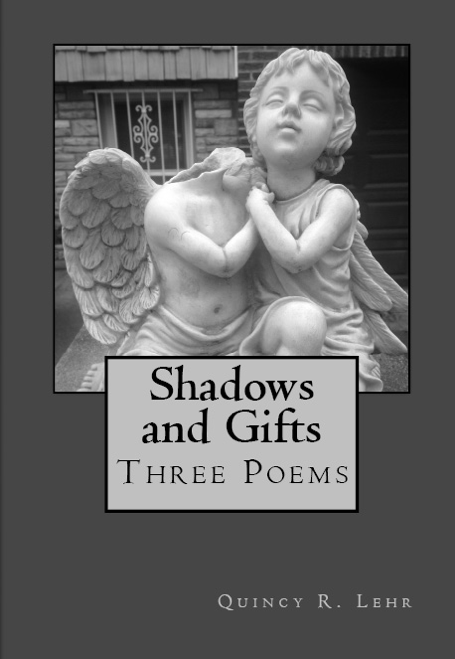 Quincy Lehr’s poems in Shadows and Gifts make a thrillingly distinctive music—lively, colloquial, felt. He knows that the purpose of poetic form is not arithmetical, quaintly counting on fingers and toes (as so many do) out of a vague atavism for meter but, rather, to make words sing. From children’s rhymes to Eliotic rag to Juvenalian satire to punk lyric to the sighs of a suicide, Lehr scores the scenes of modern life. His songs are scathing, but with a tacit sweetness, and eminently danceable. So, don’t be a wallflower. It’s late. The music’s thrumming in the other room and things are starting to get a little crazy back there! Quincy Lehr—enfant terrible and trained historian—applies his characteristic knife-edge humor to critiquing a crass, capitalistic landscape populated by pink Energizer bunnies, Bluetooth-wearing yuppies, and aging hipsters. But beyond the satirical voice, what drives Shadows and Gifts is Lehr’s eye for the details that matter and his musical, metrical talents. 'Mene mene tekel upharsin.' Like a latter-day Daniel, Quincy Lehr has arrived at Belshazzar's Feast to interpret the writing on the wall, and extrapolate it in tightly wrought verses. In vehemently crafted forms reminiscent of Clough, Laforgue or early Eliot, this angry if no longer quite so young man casts a cold eye on the carnivals of fools and knaves that is American life. The academic world of post-radical careerists comes in for serious deconstruction, nor are his fellow scribes spared the lash: 'though you wouldn’t know it/that jerk-off in a business suit calls himself a poet.' Old Possum defined poetry as rhythmical grumbling, and Quincy Lehr has produced another electric, bass-heavy kvetch, full of finely honed couplets and crushing riffs. America: read, laugh, weep, applaud. Release date: March 2nd, 2013.